One of the best ways to monetize your online media is to integrate it with your print to hold a contest. The formula works because contests invite "reader response" which advertisers see as "customer response." Both print and web work extremely well as contest announcement vehicles but after that their different strengths separate. Contest entry processing is handled on the web--the print contest entry forms of old are fading away. But print remains the preferred announcement vehicle for winners. Calling all egomaniacs...when you win don't you want something you can hold in your hands and show your friends at a party or frame and put on your wall?. Tough to do if the winners are just posted on a website. 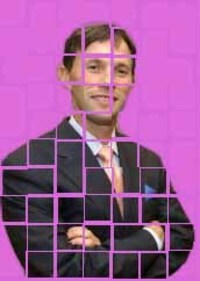 Integrated media is also a great way to involve advertisers. Typically to tap for the prizes. But in so doing something creating value that you can you can charge for, Heres how; people who enter a contest to win a prize are interested in owning that prize. Everyone registers but not everyone wins. After you give away the prize what you have left is database of people who still want the prize/product but don't own it. A dream database for any advertiser. ON your next call consider if a contest might involve some of the advertisers you call on. Media buyers and sellers agree: Stop the buzz words! During March 13-15 MediaPost subscribers, which include media buyers and sellers, were surveyed by Dynamic Logic and asked if there were buzzwords they would like to have people stop using. About half (49.5%) said yes. 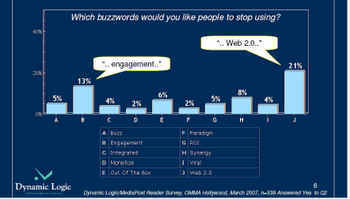 Top of their "stop using" list were the buzzwords: "Web 2.0" and "engagement." On a call, it's a good idea to check the buzzwords at the door. The problem with words like these, is they mean different things to different people, so using them often does not advance communication. I don't mean to make light of the survey. It is a great trend survey that gives a view of what to expect from media buyers in the coming year. If you sell multiplatform B to B media this is for you! A media consumption portrait top level American executives by Ipsos (ironically headquartered in Paris) has documented some long suspected patterns. A third have read a blog in the last month, but only 5% have actually contributed. Websites also prove to be important for improving a business publication’s overall offering, even more so than websites for TV channels. Over three quarters claim a website is an important part of a business publication’s overall offering, while only a third claim that a website is an important part of a TV channel’s overall offering. The survey shows the average American business leader is male, aged 51, earns $408,000 per year, and has a personal net worth of $1.7 million. And their attitude toward business is one of sound management with a willingness to take calculated risks if they feel they have good, trustworthy information. Nine out of ten say they like to keep up with the news. Eight out of ten say they are not afraid to take business risks. Seven out of ten agree that return on investment is a key factor in their business decisions. Eight in ten claim their most senior managers play a major role in business purchasing decisions. Nine in ten will only do business with companies with a favorable brand image, with five out of ten claiming those brands need to be well known. Nine out of ten also say they are prepared to pay more for quality. Eight out of ten claim to have good relationships with suppliers but are cautious when engaging in a relationship with a new supplier. This is great ammunition to prove the importance of reaching a target with multiple media. First , introduce the study and describe it's impressive scope. Then share the personal information found at the end of this post. Then, assuming your client starts nodding his head and saying things like, "Yeah that sounds like our target audience" share the media consumption information emphasizing that these people are using a variety of media to satisfy their needs. Now shift the conversation to the "variety of media" you have to offer. Online advertising dollar is volume up 26% over last year, which was the year online ad spend surpassed magazines. Yet every media organization I work with reports many accounts that spend nothing on online media. Here is a great study that can help. Most online laggards know that the world is changing around them, but typically had a bad online media buy they don't want repeated. What is great about this study is that you can invite them to look at web advertising a second time by saying, "You may have been right in the past, but things are different now. Can we take another look?" Starting back in 2003 the Online Line Publishers Association monitored why people use the web. At that time "Communications" (email, messaging etc.) topped the list taking 46% of online users time. Activities relating to "Content" was second with 35%. But as the study progressed "Content" grew steadily until a year ago it accounted for 39% of users time, almost tying "Communications" which still lead with 39.6%. This is actually huge news if you are in the business of selling ad products associated with the "Content" part of the Internet. There has been a significant shift in the past year. People are simply using the web differently than they were a year ago and content, not communications, is king. Assuming you sell advertising on a content based website, newsletter, webinar, etc. what you sell is more valuable that it was a year ago. In light this shift, this year, it's time to ask your web laggards to take another look. "Horizontal integration disrupts our whole understanding of the (magazine) medium. What is a magazine? I think we have to redefine it. A magazine can no longer be defined by the platform through which its content is distributed; it’s defined by the community of persons who share a common interest in that content. A magazine is a social network. It’s a club." Is selling media with "trigger events" Sicko? My friend Jill Konrath likes to talk about using "trigger events" when selling to big companies. The idea is to monitor news about the company you are trying to sell for reports that could trigger a response favorable to a sale. 9/11 was the biggest "trigger event" any media salesperson in the security field had ever seen. Selling with "trigger events" is an especially good approach for media sales people. Think about it. If bad news or good news comes out about an advertiser or industry, we sell communication products that can counter or enhance that news. A classic execution of this approach unfolded last Friday as Google Health Advertising offered Health Care Advertisers an opportunity to present a contrasting view of their industry than the one about to be released in Michael Moore’s documentary film, Sicko. Google identifies the "trigger event:"
"The New York Times calls Sicko a “cinematic indictment of the American health care system.” The film is generating significant buzz and is sure to spur a lively conversation about health coverage, care, and quality in America...Moore attacks health insurers, health providers, and pharmaceutical companies by connecting them to isolated and emotional stories of the system at its worst." "Many of our clients face these issues; companies come to us hoping we can help them better manage their reputations through “Get the Facts” or issue management campaigns. Your brand or corporate site may already have these informational assets, but can users easily find them? We can place text ads, video ads, and rich media ads in paid search results or in relevant websites within our ever-expanding content network. Whatever the problem, Google can act as a platform for educating the public and promoting your message. We help you connect your company’s assets while helping users find the information they seek." Think about the next "trigger event" in your industry or category. If you can link it to an advertiser's desire to communicate with your readers, you are well on the way to making a sale. Read the whole Google post on "Sicko"
Case for integrated selling: sell "compatible weakness"
When a media buyer just wants to buy print advertising from you, and not online, or the reverse, what do you say? Most often, I recommend saying, "Thank you" and taking the order. But there are times when we can influence the direction of a media buy. Then, I recommend pitching an integrated program. You can go back and forth about the strengths of print and online advertising and talk about how well they work together. But I advise the opposite, focusing on their weaknesses. As a media rep you will have more credibility talking about the negatives, and it is in the negatives that you will find print and online advertising to have total compatibility. I use the attached chart in sales training classes to point out magazine advertising's prime weakness; no feedback. The chart was designed for a B-to-B publication session but the idea is equally as true for consumer magazines. All other marketing tools available to marketers (events, direct marketing, online media) have a direct feedback loop. Magazine advertising does not. Selling an integrated package where you combine web and print closes this loop as the online part of the buy can provide a feedback loop for the entire campaign. But online has big weaknesses as well. If your target reader does not go online during the time of the campaign they will never see the ads, and once they are online the clutter and number of destinations to distract readers increases every day. Adding print to the online buy fills in these weakness by providing a presence in the physical world, as well as a destination reminder before encountering the distracting online world. To sell integrated proposals, go negative!